Is this the Best Toy for 2009 on Amazon Japan? As a family we had a lot of giggles over this Cool Pick. Has anyone purchased one of these? Would you have voted it the no. 1 best seller of 2009? Take a look through this link in Japanese to see the chart! I was a little surprised I have to say. Take a look. Would you buy one of these? 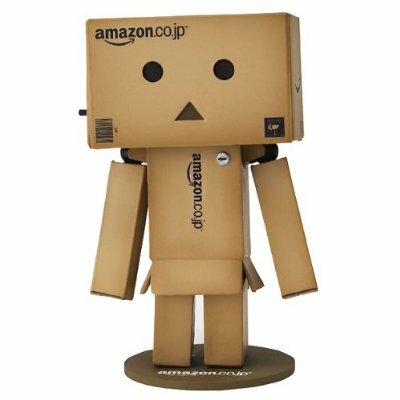 RT @Shibuya246: Best Toy 2009, Japan Amazon | Shibuya246 http://bt.io/CBKc I think there is a smaller version of this figure also. Who ever thought a cardboard box figure would be popular. 🙂 Wouldn’t mind one my self. I confess! I am addicted to Amazon. I have the Amazon prime membership through work, so it is hard to beat free shipping. And, usually their prices are very competitive. Right now I have the Yotsuba&! danboard figure on my desk. I think that is what inspired the Amazon version. I would love to get the Amazon one too. Good to hear …. I enjoy your comments on this corner ….